November is a CELEBRATION for Big Sky Quilts. It’s our 20th Anniversary doing business in Great Falls. Current turn-around time for long arm quilting is 2 weeks. Shop DAILY to increase your chance of winning a door prize donated by one of our vendors. Purchases in $20 increments will qualify you for tickets in the daily drawing, 1 ticket for $20, 2 tickets for $40 purchase, 5 tickets for $100 purchase. Shop Saturday, December 1 for the opportunity to win the surprise Grand Prize drawing. Get exclusive ruler kits and tutorials delivered straight to Big Sky Quilts each month! 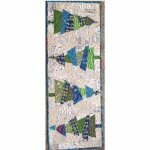 The Longarm Ruler of the Month Club is a great opportunity to challenge your quilting skills and build ruler work confidence. Each month in the six-month series features a debut acrylic ruler paired with mentorship from your local shop, step-by-step video instruction and design ideas. The November ruler is the 2 ½” x 6 ½”HQ Pillbox Template. Cost: $29.00 per month, $174.00 for all 6 rulers for a savings of at least $6.00 per ruler. Receive a different thick Longarm ruler and facilitated instruction by a fellow quilter. These rulers are not available for general sale until the conclusion of the Ruler of the Month series. Whatever your style, from elegant to traditional make this skirt the perfect accessory for your tree. Choose a main print, two accent pieces and a coordinating light fabric for the construction that makes the design pop. Construction uses a variation of the Card Trick block. There are no Y seams and assembly is really quite easy. Class is for the confident beginner as well as the experienced quilter alike. With clear instructions and great graphics to guide you every step of the way, this deceptive simple tree skirt is easy enough to make for a quick gift. Class will make the small 42” tree skirt. Make an easy and colorful lap size quilt top to brighten your comfort during the long winter evenings. Made with 2 ½” strips of 13 different fabrics, including 4 colorful prints this quick and easy projects will be approximately 55 x 70 inches. This class is designed to use your imagination working with color decisions, brushing up on straight seams and pressing techniques. A helpful technique for transporting a “work in progress” project will be included. You will need to bring a flannel backed vinyl table cloth approximately the size of the quilt for this technique. 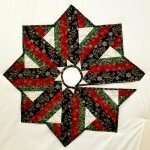 Are you tired of traditional Christmas Trees to be quilted? This class is an opportunity for you to create a fun and modern design for a table runner with blocks stitched horizntally or stitch the blocks together vertically and make a fun door hanger. Class requires a Creative Grid Spider Web Quilt Ruler and a Creative Grid Quilt ruler 16 ½” inch Square Ruler. Have you ever wanted to learn the basics of paper Piecing? This series of three classes will be the perfect opportunity for you. Each class will construct a small fast and easy 8 inch block project. Take one, two or all three classes to complete a FAT CAT, CORGI DOG or ROSE to learn and practice different skills each session.